Why would you pay $25k for a phone that isn’t even a smartphone? Well, why wouldn’t you, if it was covered in gold leaf, had 18-carat gold buttons, and most importantly, had an Orthodox cross engraved on it? 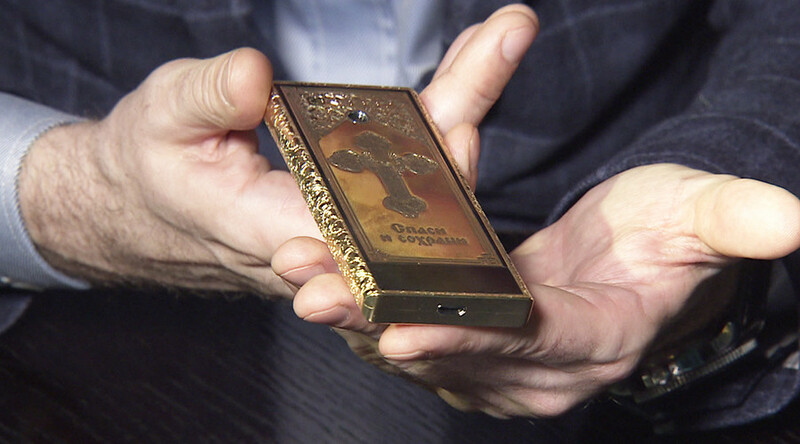 Moscow-based mobile phone company Gresso created 988 (the year Christianity was adopted in Russia) of the phones, ranging from $6,300 to $25,000, depending on how blinged-out the model is. There is a version with diamond incrusted buttons, for example. When it comes to functionality, however, forget about social media. The Orthodox phone will take you back to the blissful days of text-messaging and actually calling someone. “We wanted to minimize users’ internet addiction and concentrate on the mobile itself and the real world, not a virtual one,” Gresso press officer Anatoly Sautin said, explaining the gadget’s poor range of functions to RUPTLY. The phone is equipped with built-in memory of 32GB, a three mega-pixel camera (by comparison, Apple’s iPhone 7 has a 12MP camera) and supports the use of two SIM cards. The manufacturer offers a warranty period of one year, which seems just about fair for an item worth $25,000. “We want to give the first phone in this series to Patriarch Kirill,” Sautin said. “Next week we plan to bless several phones in Moscow,” he added. Russian Orthodox Church spokesperson Vladimir Legoida warned that owning an expensive gadget won’t make a believer any better.